Easily mounts with a clamp to any worksurface with a depth of 20" to 30"
Turn any desk into a sit-to-stand workstation in minutes, without modifying the base or frame. This HON Desktop Riser is easily clamped or screwed onto any existing worksurface, and then raises whenever a standing height workstation is desired. 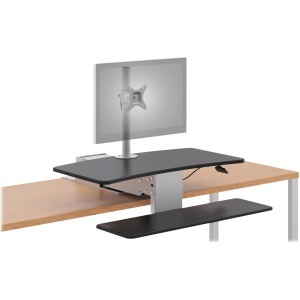 This puts the user in more control over both their environment and their posture. The two-tiered platform is quickly elevated by a gas-assist lever mechanism, which makes raising or lowering the laptop or monitor easier. This model is designed to hold one monitor.